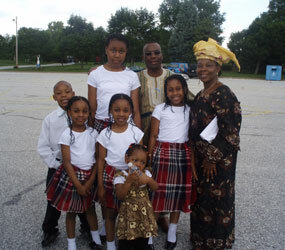 Holy Family in Randallstown held its first Celebration of Communal Diversity May 31. A number of cultures and other churches were represented, as Dominican Father Emmanuel Ogu was the celebrant and Missionaries of St. Paul of Nigeria Father Augustine Etemma Inwang gave the homily. Father Inwang is the pastor of St. Veronica in Cherry Hill. Concelebrants included many pastors and priests from the Baltimore area, including Father Andrew S. Mohl, the pastor of Holy Family. Mr. and Mrs. Andrew Mohl prepared stuffed cabbages, adding to the ethnic appeal that was the aim of a far-reaching organizational effort that included Uzoma S. Nkwopara, Holy Family’s director of religious education. Many volunteers gave their time, many under the auspices of the Evangelization & Catholic Community Outreach of Holy Family, a subcommittee of the parish council that formed in early 2008. The general intercessions were given in eight languages, as Paul Dewa spoke Hausa, a Nigerian dialect, followed by Gloria Johnson (English); Emily Harrigan (Spanish); Dennis Kast (German); Lynne B. Meneses (Filipino); Doris Azike (Igbo); Damatus Nambai (Swahili) and Osemeren Okojie (Esan, another Nigerian language).